The Romans had ruled Russia for more than three centuries, when the 1917 revolution led to their removal. A year later, the deposed Tarsus Nicholas II and his family members were cruelly murdered. Have they, however, managed to escape? In the summer of 1914, with pride, almost with joy, the Russian Empire started at war as an ally of France and Great Britain in the struggle against the German and Austro-Hungarian Empires. But the First World War proved to be a disaster for both Russia and the Romanov dynasty. In March 1917, after the death of millions, the country was in distress. In the capital of St. Petersburg, the lack of food was pushing people to revolt, the student demonstrations joined the labor strikes, and the troops called to restore order rebelled. Somedly in a hurry to return from the front, where he personally took command of imperial troops, Tsar Nicholas II presented an ultimatum: the abdication. In his name and his fierce 12-year-old son, he gave up the throne that his family had held since 1613. Shortly, the provisional government headed by Aleksandr Kerenski placed under house arrest the former imperial family at Tsarskoe Selo, the elegant palace and villas outside of St. Petersburg, where they had found refuge away from the realities of the war. In addition to Tsar Nicholas, Alexandra and Alexei, there were also their daughters, the great dukes Olga, Tatiana, Maria and Anastasia, aged between 10 and 22 years old. In addition to the humiliation of being almost uninterrupted, Nicholas' family had little to suffer during the arrest in Tsarskoe Selo. Out of the burden of power, the former clerk was now cutting logs, vegetable plants, riding their children by boat or through the park, and spending their evenings reading the family. An unprepared and outdated leader, Nicholas Romanov - as he was now called - had always been a devoted family. And this had, to some extent, been the cause of his fall. For a long time it was known that Nicholas was in fact led by his wife, Alexandra, the German princess she had married in 1894. After having four daughters, they were extremely happy when a son was born - Alexei. Their joy, however, turned into bitter suffering when the child turned out to be sick with haemophilia; as the smallest lesion could have resulted in strong bleeding, the boy had to be permanently supervised. After 1907, Alexandra and her husband fell prey to the influence of the sinister and depraved monk Rasputin, whom they were crediting with the miraculous healings of the countless diseases Alexei suffered. But on December 31, 1916, the exasperated Russian nobles assassinated Rasputin - a blow that the imperial family felt as deep as the forced abdication that would take place two months and a little later. In the summer of 1917, Kerenski was worried, on the one hand, by the scheming of his left-wing rivals, the Bolsheviks who wanted to eliminate the former Tsar and, on the other, because of the still devoted monarchs who wanted to save Nicholas and bring him back to the throne. He thus decided to send Imperial prisoners to a safe place in Tobolsk, an isolated Siberian city, more than 1,300 kilometers east, beyond the Ural Mountains. On August 14, Nicholas, his wife and five children, accompanied by 40 servants, started from Tsarskoe Selo on a six-day trip with a well-guarded train. Two days before, the family arrested celebrated Alexei's thirteenth anniversary. The revolutionary breakthrough in Russia soon led to the removal of Kerenski on the grounds that he was a protector of the former imperial family. In November, the Bolsheviks took power and negotiated a separate peace with Germany and Austria-Hungary, signing in March 1918 the Brest-Litovsk treaty. Among the many problems that the new leader, Vladimir Ilyich Lenin, was about was the fate of the former Tsar who was now his prisoner. In April 1918, Lenin ordered the family to be moved to Ekaterinburg. The local Bolsheviks had demanded for Nicholas and his family a solid, two-storey building that they baptized with a special name "The House with Special Purpose". Being safe from seeing the world through a wooden fence and having the windows cleaned so that no one can look in or out, the house was permanently guarded by a local Bolshevik detachment. The family and servants received the two daily meals in an enormous saucepan, of which the guards often served directly over the meadows' shoulders. The above description of this fatal night is based on a thorough whitewash survey when they conquered the city of Ekaterinburg a week later. But is this the truth? Two investigators tried to put together the evidence found. The first one came to the conclusion that Nicholas was indeed executed on the night of July 16 to July 17, but the former country, her son and her four daughters had been spared. As this version was not enough to catalog the Bolsheviks as violent assassins and to win the Western sympathy for the martyrs of Romanov, another inquiry took place at the beginning of 1919. Nikolai Sokolov had been named the new official investigator. On the land of the mine, Sokolov found shattering evidence, such as a small lock and a folded holster used by barbarians as fishing hooks, precious stones that had been sewn in the suits of the great Duchesses, and the skeleton of a dog, probably Tatiana. But the only human remains discovered were small bony fragments and a pruned finger of a woman between two ages, later identified as Alexandra. Where were the other bodies? At the end of the summer of 1919, when the cause of whites seemed to be lost, Sokolov left Russia and eventually came to Europe. It was only in 1924 that he published his discoveries, revealing a picture of the Soviet brutality that the world was already ready to believe at that time. For three quarters of a century, Sokolov's conclusion, that the entire family had been killed on the night of July 16-17, 1918, constituted a controversy for researchers in this case, who reported a series of contradictions. For example, when the Bolsheviks announced the execution of the former Tsar on July 19th, they also said that Alexandra and her children were taken to a safe place. One of the first foreign visitors to Ekaterinburg after the alleged massacre was Sir Charles Eliot, the British consul for Siberia. After a conversation with the chief investigator of the whites, Eliot informed his superiors that, apparently, on July 17, the former country and her children had left Ekaterinburg by train. At the same time, Brother Alexandra, the great Ernst Ludwig von Hesse, sent her news via neutral Sweden to another sister in England, assuring her that Alexandra was safe. But when the former country and her children were not seen, and Sokolov's report was published, the conclusion about the death of the whole family began to be gradually accepted. In 1988, amazing evidence emerged. A former Russian police investigator and director, Geli Riabov, succeeded in the late 1970s to follow the children of Iakov Iurovski. Iurovski's son entrusted Riabov with an unrecognized document up to that date, which recorded what had happened to the bodies after the execution. According to the report, they had been cut into pieces and thrown together with a few grenades in an abandoned mine, which had not collapsed due to the explosion. Iurovski scared to believe that the approaching whales would find the bodies, so he dug them up and moved them elsewhere. The new information put Riabov in motion, who immediately acted. Dying at night for not being seen, Riabov discovered the first bones. Several years ago he described the sensation that these black and green bones had found with signs of acid burns. One of the skulls was drilled. " Riabov made his public discovery in 1988. But official confirmation came only in July 1991, after Russian archaeologists examined the site. New skeletons have been unearthed. 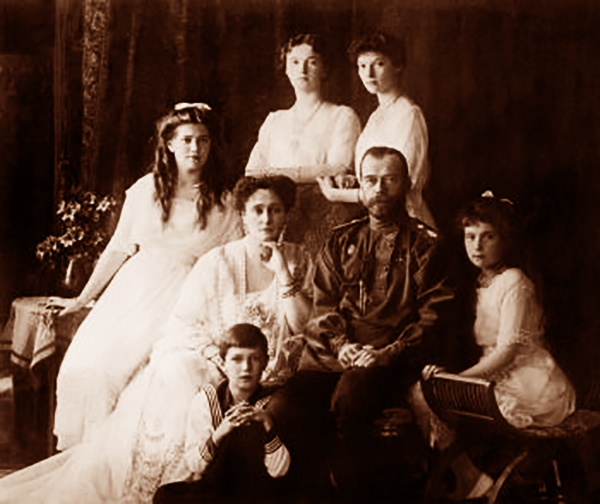 Five of them turned out to belong to the same family - Nicholas, Alexandra and three of the five children. The other four, separate, were probably Dr. Botkin and the three servants. Modern science has helped to elucidate the mystery, the four skeletons now being unanimously identified as belonging to Alexandra and the three daughters. Also, in 1993, the origin of the skull was confirmed as that of Nicholas. But Alexei and Anastasia? Have their bodies been burned in their entirety? Or escaped? The land of Russia probably still hides their earthly remnants. The great dukes were accompanied even to the toilet, whose walls were covered with obscene drawings, representing their mother and Rasputin. Nicholas was threatened with hard work when he protested shyly against this humiliating treatment. Meanwhile, Alexei had become so weak that for his daily walk through the dusty garden his father had to take his arm out to the wheelchair. In July, in the context of weakening Bolshevik resistance, the Moscow leadership ordered that steps be taken not to fall into the hands of the Promonarhists. On the night of July 16 to July 17, 1918, after twelve o'clock, Iurovski, the supervisor of the former royal family, woke up in the family, ordering them to dress and descend into one of the rooms on the ground floor. Chairs were brought for Nicholas, Alexandra and invalid Alexei, while Dr. Botkin, the four daughters and the three servants were left standing. After reading a sentence of death sentences issued by local Bolsheviks, Iurovski shot Nicholas in the head - a signal for the other members of the execution squad to shoot at the other targets. Those who did not die on the spot were quickly cleared by bayonet blows. The cadavers were thrown into the truck and taken to a deserted mine outside the city where they were cut into pieces, sprouted with sulfuric acid and thrown into a well. On July 17, the Moscow leadership received a message from Ekaterinburg: "We inform Sverdlov (a close collaborator of Lenin) that the whole family ended in the same way as her head. Officially, the family died during the evacuation. "